The Deerhurst offers a two-in-one functionality of media presentation and fireplace coziness. 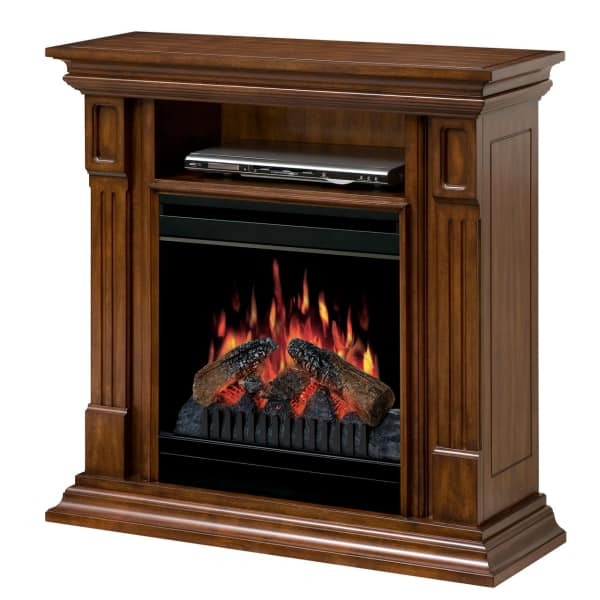 The Windham offers a functional electric fireplace that pairs a faux flame show with a powerful fan-forced heater. The user may toggle between different flame effects and control the thermostat-controlled heat to suit the needs of the moment. The whole thing can be managed with a convenient remote control. The fireplace is topped with storage for decoration or media accessories like DVD players, gaming consoles and more. Then, the top of the Windham is made to house your favorite television that measures up to 40’’. Dimplex is ahead of the design curve, realizing that the old fashioned living room is out of the picture. People no longer gather around the living room radio or bookcase. Instead, they find community around the television. Shouldn’t the fireplace be placed there, then? If you’re on the side of Dimplex, consider the Deerhurst, or any other media console and fireplace combination made by Dimplex. Dimensions 36.75" W x 36.25" H x 31"